A Midwest heavy industrial facility was planning a multi-week outage and needed to fit this project into their timing. Included in the Scope of Work for client was the removal, refurbishment and re-installation of two process critical air cylinders, the component parts of which weighed in excess of 15 tons. The location of the cylinders was inaccessible to the overhead crane in the area, and removal of the facility roof was not an option due to exterior equipment and time constraints. The area around the cylinders was congested and blocked any possible access by forklift or rubber tired crane. 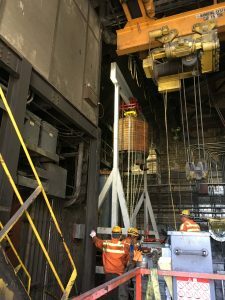 ADF designed and supervised the fabrication of a track guided, adjustable height, custom gantry crane to be used to disassemble the air cylinders and transfer the component parts to the overhead crane. Designed the gantry, the gantry track and a transfer table to handle the components. Designed the specialty lifting fixtures required to handle the components. Specified and assisted in the procurement of all the specialized components for the gantry, including the hoist, trolley, track wheels, height adjustment mechanism and track. Worked closely with the owner and the fabricator to insure that the Gantry was complete, tested, installed, and adjusted in time for the start of the outage. The cylinder refurbishment was completed on time and the gantry performed flawlessly, exceeding the expectations of the owner.